Today is my last day in Peru . . . one of the most diverse and fascinating places I have ever visited. The people here are extraordinary, but they face some enormous challenges. In only a few short days, I’ve been in the jungles of the Amazon, the peaks of the Andes Mountains, and the metropolitan capital of Lima on the coast of the Pacific Ocean. In Lima, I was welcomed by an auditorium of more than a thousand university students attending Camino de Vida. I had the unique privilege of encouraging them as they begin another academic year. They were so excited about serving Christ with their lives, making His heart for the world their chief vocation above all else. Their passion and enthusiasm was inspiring to see, and I look forward to seeing how this next generation of students impacts their country for Christ. 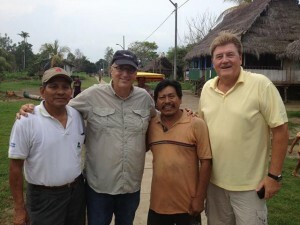 Along the Amazon River live hundreds of indigenous people groups who have never heard the Gospel. I met with church planters who travel the river by boat, visiting each village to share the life-changing message of Jesus. 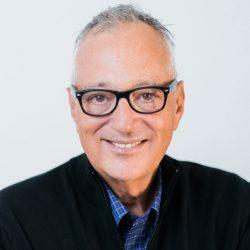 Churches are being planted in places where outsiders have never set foot. Just think—with all the amazing technological advancements in the last century, these Peruvians have literally never heard the name of Jesus spoken! Witnessing this unbelievable work reminded me of the urgent need for more Christ followers to reach every corner of the earth with the Good News. I soon found myself thousands of feet above sea level in the Andes Mountains. I was introduced to a community of people who earn a meager livelihood by working long, dangerous hours in the salt mines. Their pay is next to nothing . . . barely enough to feed their children. They literally make their homes in mountain caves . . . damp, dark, and cramped. I met an incredible couple who have dedicated their lives to reaching this specific community. They started a feeding program here that serves two meals a day to 60 children—a lifeline for dozens of parents who have no other hope. The poverty in these remote mountain villages is real, and the needs are extensive and pressing. 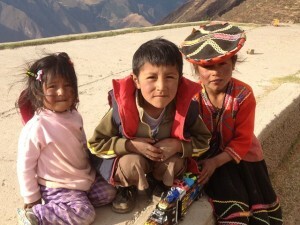 The situation is no less dire than in the lives of Peruvians with special needs. Today, I had the chance to help provide wheelchairs to children who have spent most of their lives immobile. These wheelchairs gave them a freedom they had never experienced before . . . I wish you could have seen the joy on their faces! We also gave each child a copy of the New Testament in their own language. I knew God had used us to be the hands and feet of Jesus. As my work on this trip wrapped up, I wanted to make one last trek . . . a “bucket list” adventure you could say . 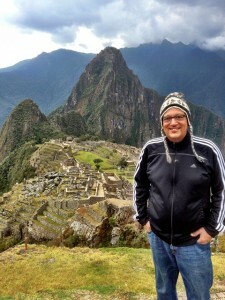 . . to see Machu Picchu, one of the Seven Wonders of the World. Gazing over the unbelievable view, I think back on all I’ve seen in my time here. Meeting the Peruvian people and seeing both physical and spiritual needs met is a great reminder to me of why World Help exists—to show the love of God by bringing help for today and hope for tomorrow. And it is an encouragement to see this happening in every corner of the earth, even here under the rainforest canopy and in the shadow of these breath-taking peaks. Please continue to pray for the life-changing work taking place in the jungles, mountains, and cities of Peru. The people desperately need basic necessities and to hear the transformational message of the Gospel. And where God leads, we will continue to go . . . to the ends of the earth!